This may be Princeton’s best kept casual dining secret. There has been a small café at the YM/WCA for some years now, and since last November it’s been run by Jirada (Da) De Toro. In addition to fare such as sandwiches, burgers, quesadillas, and even some pasta, Da’s Café & Catering also serves up the tasty Thai dishes of her homeland, where she had extensive formal culinary training. This is a small place, but during the summer there is a patio outside with additional seating. They are open for breakfast, lunch, and early dinner. I stopped in for lunch the other day and enjoyed the Pad Thai in the photo along with sweet Thai iced tea. 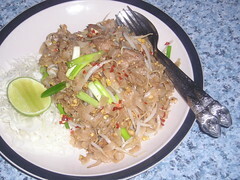 The Pad Thai is available with pork, chicken, or vegetables, for a mere $6.25. Da’s husband, Robert De Toro, urged me to come back and try one of Da’s special duck dishes another time, and since they are open until 7:00pm, I could even call up (609-356-8913) and order a ducky dinner to take home. Also, look for Da’s cooking classes this fall at the Princeton Adult School. Another dish that is clearly a favorite of Robert’s is served as an occasional special. Khao Soi is from Da’s former home in Chiang Rai in northern Thailand, where the couple used to own a restaurant. Thailand’s loss is our delicious gain. I had NO idea this cafe was still open. Faith, you are a wonder. I am constantly discovering great places to explore thanks to you!